Greetings to all my friends and family, especially to those of you who are cold-weather-challenged! As the title in the Subject heading above indicates, yes, here I go… again. Onward in my ongoing quest to see how cold I can get before I’ve had enough of it. As many of you already know, I have subjected myself to sleeping at the Ice Hotel above Sweden’s Arctic Circle a few winter’s ago, only to complete a repeat-feat the following year just outside of Quebec. Those two trips, although an icicle shy of balmy at their respective MINUS 5 and MINUS 4 C degree sleeping temperatures (INDOORS), were merely practice for the trip I am about to embark upon. This trip is a realization of one of my most precious childhood dreams (never you mind that I fell out of that bunk-bed at camp, and left my head impression on the floor). Yes, folks, I am heading North. Waaaaaaaay North. As far North as anyone can go! 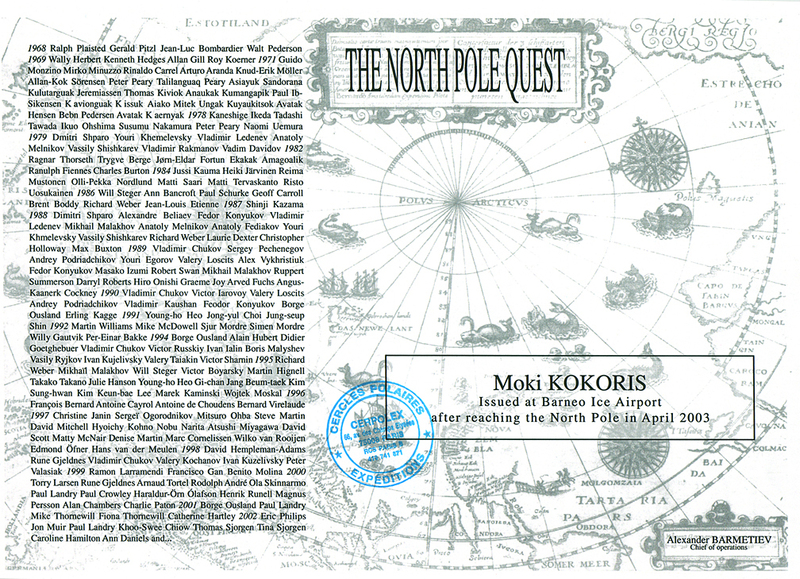 I am signed on as a member of the Global Adventures Expedition to the North Pole! Yes, I know. Some of you have dropped your jaws. Some of you are wondering how tall that bunk-bed really was. And still others of you are just shaking your heads. But I doubt that any of you are genuinely shocked at this news. After all, my Nissan Pathfinder sports a license plate which reads: LOVE ICE, and a bumper sticker which says: NORTH POLE OR BUST! So…… I am about to live out that childhood dream of mine. Assuming that the arctic weather gods are not too angry for all the global warming we’ve inflicted on them, we should all be standing on the pole itself, on the 90-th degree, on April 17-th, 2003. The conditions are rather iffy at best as I type this letter, with MINUS 25 temperatures, not taking wind-chills into account, but I am hopeful that things will settle down by the time we are ready to leave for the ice-cap. 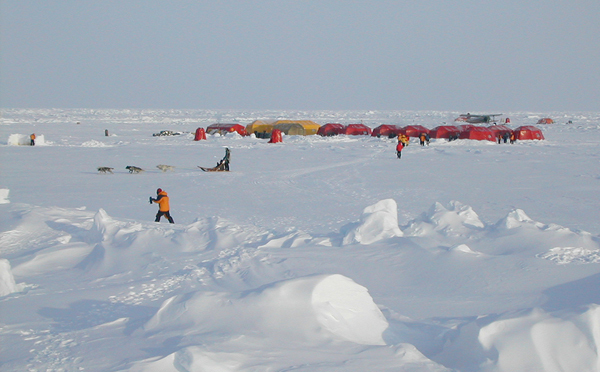 We are to sleep at the Drifting Ice Base Research Station at degree-89 for two nights — in tents, a la scout camp, albeit without the chirping of crickets or the marauding raccoons. Polar bears maybe, but thankfully no raccoons. I can feel your envy as you read my words <uhuh….>. So… as I set my sights due North, to search for my frozen white world, I bid all of you a warm farewell. And as most of you are watching the daffodils poke their yellow heads out of the ground, think of me, because the chances are quite good that I will, myself, be occupied with pastimes such as poking gobbets of snow out of my more intimate creases with a warm toothpick…. So, how’s THAT for a lovely mental image?!? Well, don’t complain because I had intended to end this letter with telling all of you that I will be researching whether, at MINUS 25-degrees F, pee freezes BEFORE or AFTER it hits the ground…. Now, aren’t you happy I chose the first ending? On that note…. I will go continue packing. Question is, should I take a bathing suit? You will be hearing from me again – after I return, hopefully without any polar bear teeth-mark souvenirs. And perhaps I will collect an adequate plethora of factual information to be able to finally write that: “SLEEPING ON ICE FOR DUMMIES” book. I already know for a fact that drool freezes…. to your face, no less! 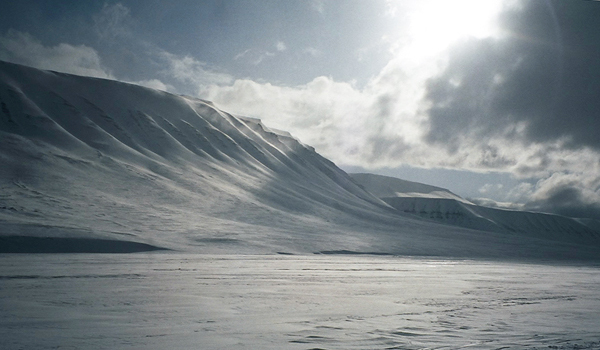 A tidbit of trivia: Fewer people have stood at the North Pole than have summited Mt. Everest! Wish me luck! It just occurred to me that I am sending these Email updates in a blatantly unsolicited manner. Dare I call it eh…. err… oh say it ain’t so….. SPAM? But regardless of its definition, here is a running update in case any of you are interested or need a reason for a resounding guffaw as well as a thigh-slap and a finger-point in my general direction….. The ’3 legs’ title in the subject box does not imply that I have flown over highly radioactive territories which would cause me to sprout an additional limb. What it does mean is that I have successfully completed three of the 5 legs of my journey, the return 5 notwithstanding. I am discovering that in what superficially seems to be a blank white world, there is much more here than a clean slate upon which to leave one’s impressions, and that there will be just as many impressions which will be indelibly engraved onto my heart. There are a thousand hues of blue-gray. There are even more shades of minty turquoise and cool aquas. And yes, there is a sun….. out there somewhere…… behind all the marshmallow clouds. I am currently sitting in my room at the hotel in Svalbard in front of me trusty laptop. It is an unassuming hotel, in an unassuming town. There’s no room for anything awe-stentatious here. 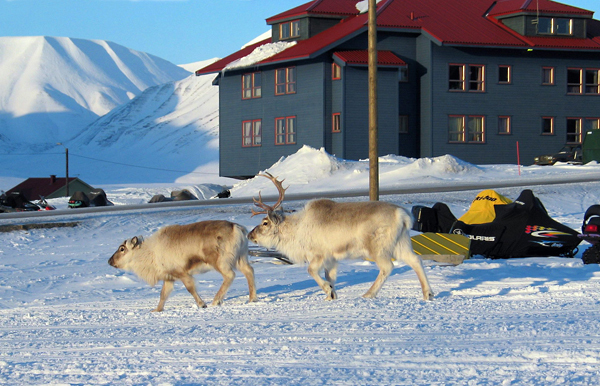 This is Longyearbyen, an old mining town – strictly utilitarian in nature, but lately changing its flavor ever so slightly to accommodate the more frequent tourist whose synapses misfired while perusing the Florida travel guide. So, as I was saying, I am sitting in my room, looking out the window, and noticing the faint misty outlines of three reindeer as they prance past in the thick snowfall. It’s such perfection in its imagery that it almost seems as if they were trained (not to mention, paid well) to do this on demand! I look at my topographical map carefully, and I am positive that there are steep mountains just on the opposite shore of the fiord, but for the time-being, I will have to trust my judgment alone as they are completely obliterated by the swirling snow. And as much as jet-lag has worn me out, I am still awake. It is strange that there is no sunset per se. 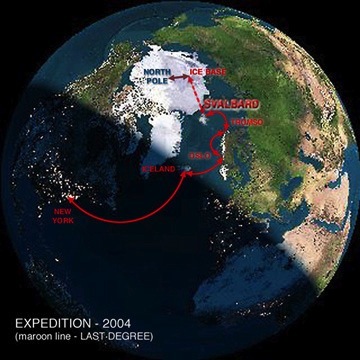 Svalbard is fast-approaching its 4 months of the midnight sun. How does anyone here sleep when it’s full daylight at 3:00AM? Then again, maybe THIS is where I should be living; with my ridiculous sleeping habits the way they are. People here go for a snow-jog at midnight. Forget daylight savings time. It has to be a tremendous physiological adjustment which the local residents grow accustomed to. By default…. Not much choice in the matter, is there? Well, I will end this update here. I must now go pick up some of the equipment which I will need to bring with me. And… I have to make an offering to the weather gods to appease them so that they can turn off the snow machines in time for our departure to the Drifting Ice Base tomorrow. Assuming the positive, we will all be sleeping out there on the ice at the 89-th degree, lovingly dubbed Borneo, tomorrow night, and then….off to the pole on Thursday! Send good thoughts North, please…. Look out, Santa. The Icewoman Cometh!!! Now, you will all kindly excuse me while I go learn how to use my new GPS unit. Can’t wait to see that number 90!!! Subject: Tie down the skinny ones! Hmmm…. How does one describe what is occurring just outside my window? The title of my update, of course, may give you a clue. Last night, I decide that in order to be able to sleep, it might be a good idea to draw the drapes closed to block out the night-time sun. Smart. I did sleep, as opposed to the night before. At somewhere around 6:00am, I awoke to some major window-rattling. My hotel is but 6 kilometers from the airport, and I was convinced that the Antonov plane which had delivered one expedition group up to the pole yesterday was returning and was about to land. I bolted out of bed to watch this monster come down and land. Alas, to my surprise, it was not the polar aircraft bearing down, but the polar wind! The roads which were here only yesterday are simply gone… If it were not for my nice comfy warm room and the few buildings which I can still see, I may as well BE at the pole! I estimate the snow-laden winds to be gusting at 50-60 mph… Can you say: hostile weather conditions? Not too conducive to flying any kind of plane – not even the Antonov-74 which is supposedly the world’s best polar aircraft because of its unique design. It belongs to the category of STOL aircraft (Short Take-Off and Landing). And that is certainly the situation we have here at this airport between to mountain ridges of the fjord. Nonetheless, I doubt that even it can fly in these conditions. The first flight for our group up to Borneo is set for 1:00pm, but we may have to adopt the basic and very typical approach to many an expedition, namely: hunker down and wait this out. Quite honestly, I’d rather be hunkering here than at the pole. The ski group which is there at the moment can’t be having too much fun, especially taking into consideration the fact that we here in Longyearbyen are still 600 miles south of degree 90. I can only imagine what is happening up there! What is complicating matters is the effect of the full moon. We may not feel the moon’s effect so much in lower sections of the globe, but up here, it is a major force to be reckoned with. Allow me to explain, and take notes. There WILL be a quiz when I return! 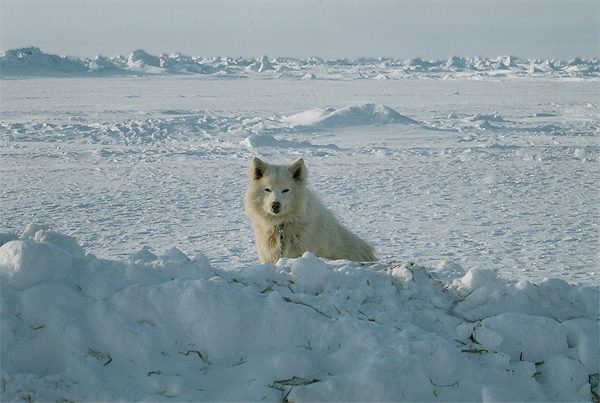 The ice floe of the frozen Arctic Ocean is permanently adrift since there is no land to stop its movement. It is pushed both by wind and ocean currents, and undergoes tremendous stress and strain when the pack ice speeds up. This happens after a storm as well as at the time of the full moon. We now have BOTH! On such occasions, the ice will most definitely fissure and split, opening up leads of open water. This could be a teensie bit of a problem, especially if that’s where your tent happens to own real estate. The term ‘human popsicle’ comes to mind…. Not that the nearly 14 THOUSAND foot depth of the ocean below makes any difference whatsoever, at least it’s less than 3 minutes to find out if you’re going to be spending eternity wearing wings up in the clouds or burning below while sporting a pitch fork and little pointy things on your head. However, the main concern is not necessarily the danger of being in the wrong place at the wrong time, but the fact that the runway may be permanently damaged, making it imperative that a new one be constructed in record speed. I don’t care if you’re a Ukrainian or a Martian pilot, you cannot land an Antonov just anywhere. And stating that cracks in the ice-runway are an inconvenience could be considered as somewhat of an understatement. This plane is far too heavy, and sets down in tremendously hard-hit fashion to keep it from skidding. Additional problems are created by the piling up of pack ice which can form huge pressure ridges of up to 12 meters (which would be close to 40 feet)! Talk about speed bumps of monumental proportion! The reason this happens is that the pack ice drifts against the wind deviating off course at 30-40 degrees to the right. Even when the winds die down, the inertia keeps the ice moving for another 24 hours. If one plate collides into another, any poor unsuspecting expeditioner may get a quick flying lesson. Welcome to the Arctic Amusement Park. Who needs Disneyland when you can have all this?!? 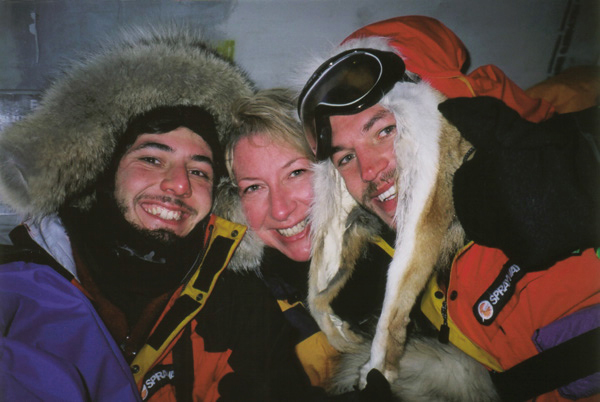 Well, you can’t say that I have not learned a lot about polar travel…..
Anyway…. as bad as the weather is, I am going to venture out of doors, and see how long I can retain my vertical posture. I mean, this IS what I came for – of my own volition…. And I need to give my military-edition Arctic gear a test run. As good of a place as any…. Should you not hear from me for a couple of days, assume that the weather machine took a bit of a breather, and that I am off to follow my dream…. Wish us all luck! P.S. If I reach the pole, I must do everything in my power to contain my overflow of emotions, and must keep from crying!!! For if I do, I will freeze my eyelids shut! No joke! Bet you didn’t think of THAT, didja? to the weather gods, I THANK YOU! WE’RE OFF TO THE POLE!!! 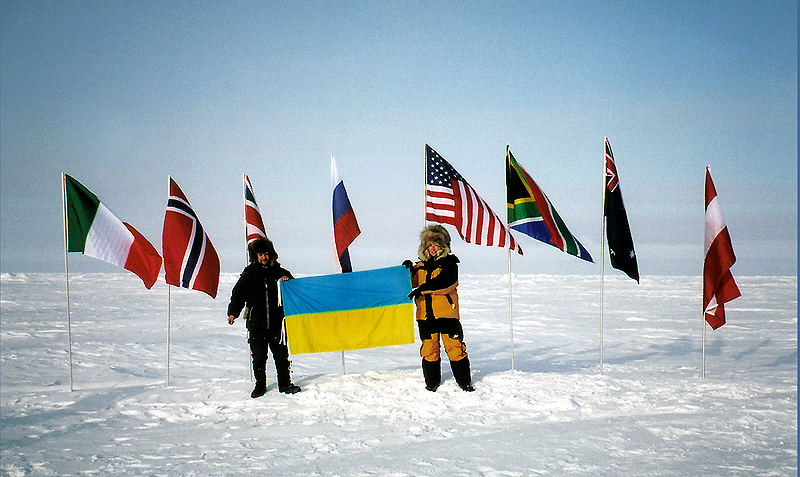 I AM ELATED TO ANNOUNCE THAT I AM NOW OFFICIALLY THE FIRST WOMAN TO HAVE FLOWN THE UKRAINIAN FLAG AT THE NORTH POLE! YES, THE NORTH POLE. I MADE IT!!! I MADE IT!!!! I MADE IT!!!!!!!! I WILL BE WRITING A FULL STORY IN THE NEXT TWO DAYS OR SO. TOO MANY EMOTIONS AT THE MOMENT…. OF COURSE, THE STORY MAY BE SOMEWHAT ANTICLIMACTIC AFTER THIS E-MAIL, NOW THAT YOU KNOW THE OUTCOME, BUT THERE IS SO MUCH TO SAY. FOR NOW, ALL I CAN TELL YOU IS THAT THIS EXPERIENCE HAS INDEED CHANGED MY LIFE – IN MANY, MANY WAYS! I MUST CONTAIN MY TEARS…. Now that the last remaining ice crystals on my breath have thawed, and that the over-flow of adrenalin has been somewhat contained, I can begin the last installment to my North Pole Expedition story. As I have said before, this part may seem a bit anticlimactic after you’ve already read that I did reach the pole, but you might find parts of the story amusing nonetheless. It is embellished with trivia which you never can tell if you may need the next time you’re a contestant on Jeopardy. So, bottom line is: pay attention! Hmmm…… Where did I leave off? Ah, yes. Our expedition group was about to leave for Longyearbyen airport to depart for the Ice Base at Borneo. The weather had been bad the day before, but improved just enough to allow a flight out. Or so we thought. Nooot sooo faaast. 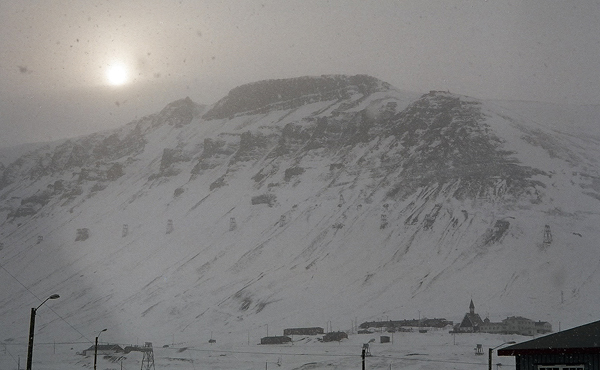 This is Svalbard, folks. The problem was that our group was large enough that it needed to be divided into two; the first half being the marathon runners and the cross-country, or rather cross-ice skiers, and the second, consisting of those who simply wanted to stand at and experience degree-90N. The first group left for the tarmac, loaded the aircraft, only to sit on the runway for an additional 4 hours, waiting for the wind to subside enough for a safe take-off. Wind-sock a bit limp, and off the went! The flight is a little more than 2 hours there, and with a one-hour drop-off layover, the second group would have been ready to fly about 5 hours later. Now, I said that we were READY to go. But did we? Nyah-uh…… You see, whoever made the offering to the weather gods, apparently wasn’t aware of the second group. There should have been TWO heaps of sacrificial mutton instead of just one…. which meant that the plane did not return to Longyearbyen, but had to continue all the way to Norway’s mainland due to bad visibility at our airport – where we sat and relished in the lovely view of beige linoleum floor tile for an hour or two more. <sigh> Back to the hotel for a night’s sleep, or something resembling sleep, taking the 24-hour daylight into account. A second try in the morning was our only hope. One last shower, a caffeine fix, aaaaaaand they’re oooooooff! This time, all systems were go! Thankfully! After a stern ‘Willkom to da R-r-rawshen Ice Baze’ speech as well as the informative ‘These are the rules or you will be staring into the barrel of a sub-machine gun’ lecture, we made ourselves at home. 8 or 9 people per tent, cots and sleeping bags at the ready. Just like summer camp. But unlike my summer camp replete with its aromatic latrines, we had what I dubbed as the two red “pee-pee tee-pees.” I will leave the vision of those to your imagination, and will tell you that whatever you’re thinking, you’re probably correct. An experience for sure! All I will add, however, is that I’d hate to be um… eh… constipated…. Gives a whole new meaning to the phrase: “sh*t or get off the pot.” ‘Nuf said. Meals…. Cup o’ Noodle, but WITH chicken! We’re talkin’ class here! Hot oatmeal or bread and cold-cuts (yes, pun fully intended) for breakfast, and stew or soup, Russian-style, for lunch and dinner. Not bad considering where we were located on this planet. We even had (drum-roll please) a cappuccino machine! Imagine that! Will wonders never cease…. And now for a look-see around. This is, after all, what I came all the way up here for. To experience the ice-cap…. the frozen crust of the earth’s cranium. Oh, I know you’re dying to ask me, “And how cold was it?” Well, aside from the typical “It was as cold as a witch’s…” uh… never mind… let me just say that the little thermometer I had attached to my zipper tag goes down to minus 20. And I could’ve sworn that I could hear a faint sucking sound when I checked it. That was the sound of all of the bright red fluid, which under more ‘normal’ conditions resides in the narrow tube, running scared and cowering deep inside the small round bubble. Talk about your basic shrinkage! So, I couldn’t tell exactly how cold it was except that it was considerably LESS than minus 20 according to my high-tech sources. But for Siberian Sybil here, not a problem at all….. especially since she’s donned electric yellow and black Russian-edition arctic gear, and a ‘stolen’ from either one or the other expedition leader furry hat (they call them their dogs). I felt no cold. I felt no pain. But I did feel like a Michelin bumblebee…. So, this bumblebee stuffed her camera and extra film deep inside her warm parka to keep it from freezing, and she made like a real explorer. At first, I was simply fascinated by the sounds of my boots on the snow. Because it was so cold and dry, the snow squeaked very loudly. However, as I walked, the pitch of the squeaking would change depending on the thickness of the ice underneath it, and came to a relatively high pitch whenever I was approaching an invisible crack in the ice. In certain spots the pitch changed abruptly enough that you could almost ‘play’ a simple melody with your feet! Ah yes. Once a music teacher, always a music teacher. Anyway, these were the songs of the Arctic. Add to that the sound of the wind, and it’s practically a symphony! Music to my polar ears. The only thing missing was the dancing of the aurora borealis, which was not visible due to the midnight sun even if it was there. I walked some distance away from the camp, all the way to where the pressure ridges began. These are large sheets of ice which have been pushed up into vertical or near vertical positions by the shifting of the ice-cap, some of them 15-feet high, where days before, cracks or leads of open water had been. The depth of the turquoise and the intensity of the blues and soft greens is impossible to put into words. A concerto of color in and of itself. Every hue imaginable. Every shade imaginable. An infinite sculpture garden which stretched as far as the eyes could see and beyond. Three full rolls of film shot right then and there! However, no matter how good the photographs are, they could never do this landscape justice. The play between these and the thousands of shades of white, all set up against the painted sky was better than the best poetry I’d ever read. Excuse me for being such a romantic, but it’s quite apropos here. But since I have gone off on a bit of a tangent, I shall return to my story now. While we were on our way to Base Camp, the marathon runners had been busy running their race (at minus 29 no less), but had to, unfortunately, be picked up from the North Pole before they had completed their full 26.2 miles. Russian helicopter red tape of some sort. 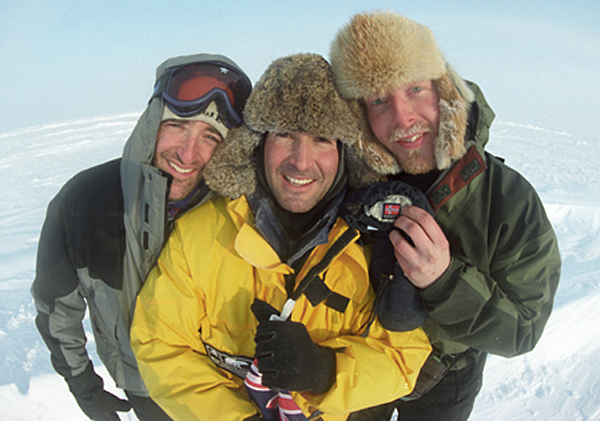 So, they recorded their times at the point of interruption, flew back to continue and finish the run at the Ice Base. By the time our group arrived, most of them, adorned with eye-brow icicles, some nursing mild frost-bite, were taking off their running shoes, and comparing results. One of the runners who should have been with the rest of them, had been detained with our second group, and arrived with us, while the rest were completing the race. I felt terribly sorry for him because he had come such a long way to be able to compete. But, after a brief weighing of his options, he decided that he would run the full marathon right there at the Ice Base! Go, Paul!!! He was relentless in his resolve. And this, my friends, is a true champion! I could hear the soundtrack of the “Champions” movie playing in my head. The rest of us took turns cheerleading (not very pretty, I must admit). Paul ran wearing a Santa hat on his head…. and sporting a large duct-tape #7 on his chest. Never mind the fact that he is 13 years younger than I am, when I grow up, I want to be just like him! And the best part was that during his one-man marathon, he turned 34 years old. What a thing to do on your birthday, huh?!? Anyway, all times tallied. Winner: Martin Tighe from Rhode Island, originally from Manchester, UK. Congratulations, Martin! But, since I am getting carried away – again… I will move on to the following day. THE day. N.P.-Day! Yes, the day I had waited 47 long years for – even before I knew little more about anything besides my Cupie Doll. OK? Done? Alright…. and as Ed Sullivan would say: Now, back to the ‘shoe’…. After a few hours of what I think was sleep, I got up, put my bumblebee costume and my ‘borrowed’ dog back on, and went out for a stroll while the rest of my tent-mates rubbed the proverbial frost off their eyelashes. I stood out in the open and simply breathed it all in. Suddenly, I heard a distant gunshot. Hmm…. must be some Russian sentry scaring a polar bear off. But, to my surprise, that’s not what it was at all. It was the ice cracking. And, in cartoon-like fashion, the crack travelled at lightning speed – and shot past me about 5 feet away! Imagine being witness to that! I straddled the crack, and took a photo. I marked the time. What was a pencil-width crack at first, spread to a foot-wide lead within an hour. By the time breakfast was over and done with, the lead was about 3-feet wide. This was the lead we had to jump, yes leap across to get to the chopper which was our transportation to the 90-th degree. Let’s just say that I was quite happy to have visited the pee-pee tee-pee prior to that “on the thirteenth day of Christmas bumblebees-a-leaping” experience…. Quite scary. NO room for a slip-up here or you can call yourself a human popsicle in 3 minutes flat! Feat accomplished….<whew!> Wipe sweat off brow…. Anyway…. We take off again to continue our flight to the top of the planet. The helicopter flies in a circle a few times, trying to hook onto exact 90 with its GPS. 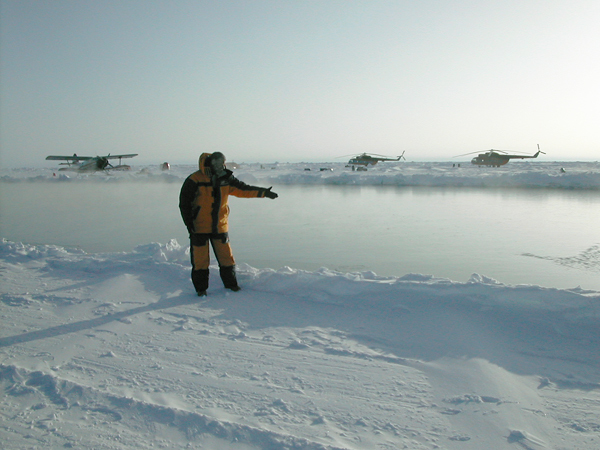 It tests the integrity of the ice by tapping it with its landing gear. Not safe here. It moves over a few hundred yards, and this time we land. My heart is pounding so hard that I’m not sure it won’t escape from my rib-cage. The North Pole. THE North Pole!!!! I am here…. First foot-step on the polar ice-cap…… Call the time, Moki! TIME OF ARRIVAL: FRIDAY, APRIL 18-TH, 2003, 13:50 MOSCOW TIME! I walk off in the direction of where my own GPS shows me that exact 90 is, and I stand there for a brief eternity. Alone. In my solitude. In my dream of dreams…. I am far enough away from everyone that I am experiencing total silence except for the sound of my own breath, and my own weeping…. Tears do not freeze if you wipe them quickly…. There is a reverence here. This is the realization of my deepest wish. My most precious journey finally at its ultimate destination. I am moved with overwhelming emotion, and I take it all in with wide open eyes…. I revel in the sanctity of the moment as long as I need it. My time and oneness is respected by the others who know exactly what I came here for. They are here for the same reasons, and no one needs to ask why. Each of us communes with the place in our own minds. THIS we will remember until our last breath…. I re-join the others to celebrate. And….. I pull out the Ukrainian flag which I had brought with me. I hold it out in the wind, and am honored to become the first woman to fly a Ukrainian flag at the North Pole! Talk about a Kodak moment! For the rest of the photo-op, I ask that one of the helicopter pilots, who is a Ukrainian himself, hold the other end. A historical moment indeed! It is nothing short of a kick-in-the-pants to be standing there! I am oozing exultation…. I got my bag, and took out the few things which friends had given me to take to the pole for ‘energizing’. I placed each of those items onto the snow, took a photo and returned them to my bag. Last of all, I took out two large water bottles and filled them with the surface snow. The meltwater from this snow will have its own honored place on my shelf at home, where many other such containers sit, filled with water from various glaciers and mountains I have visited. This water, however, will get the most prominent spot! This is Moki’s Oscar! I took one last look, boarded the chopper, and we departed…. Upon arrival back at Base Camp, I noticed that the lead which we had jumped over only a few hours before, had spread to a width of 20 feet! It’s amazing that the ice shifts quite this much. Thankfully, the helicopter landed on the tent side of the crack because my mind wasn’t particularly too set on swimming…. in 14,000-foot deep water, its frigidity notwithstanding. I’m back…. Back to the edge of the lead. Helmut told me that he wanted to show me a phenomenon of lead ice. He got on his knees and leaned forward. For a moment there, my heart stopped because it looked as if he’d fall in. I grabbed his parka. He laughed, and told me to let go and watch. This was just too incredible. He leaned on the freshly-formed ice skin of the open water, and it gave as if it was made of rubber! The more he pressed on it, the more it stretched! I have never seen elastic ice!!! When he let go, it returned to a flat horizontal not unlike a rubber-band. He did it over and over, and never punched through it to fresh water. The ripple traveled some distance as if the ice was a trampoline! Amazing! I’m not sure if that trait is due to the salinity of the water, but I was once again in awe of Mother’s Nature’s sense of humor. It just didn’t make any sense, but there it was. On a side note, I’d like to take this opportunity to add some comic relief to this story. The other of our two illustrious leaders, Curtis, used to run an ER at a Florida hospital. He had decided, or rather hoped, that he would become the first to perform surgery (no lobotomies naturally….) at the pole. However, this is not something any doctor can really plan in advance. But Curtis had brought a mini-version of an OR with him – just…. in…. case…. Realizing that our expedition was nearing completion, he began feeling the heat (strictly metaphorically) of a deadline. And now, with overtones of desperation in his voice, yet with a smirk, he walked around asking anyone and everyone, “Do you have any lesions that need to be removed?” “Does ANYONE need any surgery done?” The only ‘surgery’ he got to perform was the removal of an embedded splinter. Sorry, Curtis, that doesn’t count as real surgery. Better ‘luck’ next year… So, should any of you who are reading this desire to be in the record books, call Curtis and make a reservation for next April. We celebrated our successes, as well as out last night on the ice by having some fun. Paul, our lone marathoner, had thought ahead and brought a jar of bubble fluid. He started blowing bubbles as the rest of us observed. Did you know that bubbles freeze? Yup, they formed in normal fashion, but would quickly turn a hazy white, float up for a bit, and then collapsed and fell limply to the snow like wads of cellophane. Who’da thunk? Some people sang, others flew a kite. It was like a bunch of grown-up kids having the time of their lives. No wonder I didn’t want to leave! Partying over, one by one we brushed the fur off our teeth and retired for one more night on the ice, but this time it felt like it was our ice. I have to admit that I had been getting somewhat concerned with the integrity of the ice changing so rapidly. We had only one more night to go, but the tents were staying up another 2 weeks. Weren’t the Russians who run the Ice Base worried? When I asked, I got a chuckle in reply. “No, it’s all in a day’s work,” they answered. Sure enough, the following morning, the temperatures had dropped to 37-below, and with the wind, I calculated it to be somewhere around MINUS 50! Helmut and I went out to check the leads. What leads? Where the leads had been only a few hours before, now there were pressure ridges! Endless snakes of standing ice-shards. No open water whatsoever! They had all closed right back up. No wonder the Russians were so oblivious…. Sure makes you think about the fragility of it all. One last walk to the helicopter…. A long and silent one. None of us spoke. None of us wanted to leave this mesmerizing place; I least of all. I am sure I left part of my heart up there. After all, it had finally come home…. and now I was ripping it away. And during that walk, I promised myself that I would return…. Mark my words! During my flight back to Oslo, it occurred to me that this would be the first time in over a week that I would see a tree, that I would see any colors in the landscapes other than white and blue, and the first time I would once again witness the darkness of night. Can’t say I had really missed any of them. This was an experience beyond my wildest expectations. In conclusion…. I have returned a different woman. I have experienced a sense of belonging to our planet, and at the same time felt smaller than a speck within a universe previously only imagined. I have come to know true camaraderie of people with the same desires and visions and hopes. I have lived this dream both solo and with them. To discover the deep significance of existence is a rare joy, and while I stood there in the white windy presence of eternity, and in the silence and vivid elemental splendor of the Arctic North, I felt peace and spiritual harmony within my soul. Ironically, in this ultimate adventure upon a boundless sea of ice, I have witnessed the power and the magic of life itself. I am humbled to have been able to stand at the very top of the world, and to understand that no one does so without bringing some of it away with him nor without leaving something of himself behind…. This, my friends, is the very essence of what I call: Polar Nirvana! Now, you will all excuse me while I go begin writing that book I mentioned earlier: “Sleeping on Ice For Dummies”…. But AFTER I chuck my toothbrush, and revel in the joys of the flushing mechanism on my toilet!